What is Peter Abelard known for in philosophy? Peter Abelard (1079–1149) was the French theologian who wrote Theologia Christiana, an attempt to use logic for explaining Christian dogmas. His expertise in logic drew students from all over Europe. He was the first scholastic to write about Aristotle’s On Interpretation, together with Boëthius’ (480–c. 525) commentary on this work. Abelard made a distinction between the meaning of an expression—what it names—and the idea in the mind of a speaker who uses the expression. He did not think that words signify the images in the minds of their speakers. Meanings are what true or false sentences say or signify, which lies outside the minds of their speakers. The distinctions in Abelard’s innovative philosophical theory of reference remain relevant to contemporary philosophers of language. 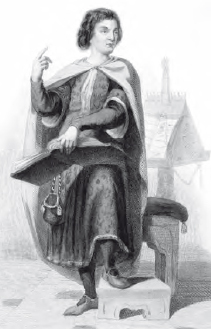 Peter Abelard attempted to use logical arguments to explain Christian dogma (Art Archive).